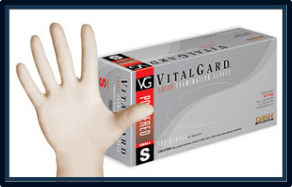 Dash Vitalgard Lightly Powdered Latex Exam Gloves. This excellent line of gloves is ideal for dental and medical applications. These gloves are 9.4" in length and have a beaded cuff for easier donning. These gloves are 6.3 Mils thick and have a smooth surface for a excellent grip in wet or dry procedures. They are lightly powdered so they go on with little effort..